The Hoff appears to have responded to Gallagher's comments that the Baywatch star is more psychedelic than his brother. David Hasselhoff has hit out at Liam Gallagher for using him to insult his brother, Noel. Taking to Twitter in a now deleted tweet, he wrote: "Why trash your brother @NoelGallagher of all people&then include me?If Oasis had done a cruise I would have gone ALL the best". 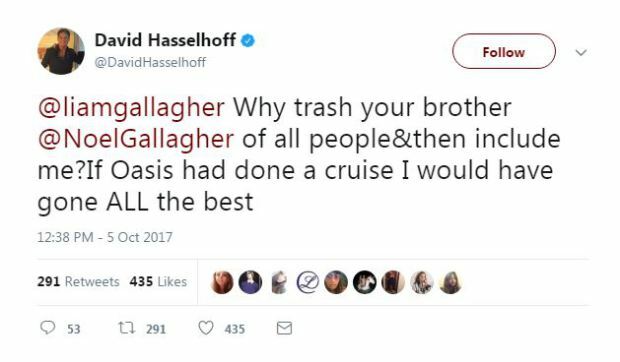 Hasselhoff's tweet is a response to Liam Gallagher's interview with Chris Moyles on Monday (2 October), where he made fun of Noel's new material, and suggested he wasn't cool enough to make psychedelic music. After accidentally picking up an advert for the Baywatch star's cruise, Gallagher joked: "He’s more psychedelic than our kid." Taking on the genre as a whole, Gallagher mused: "If you’re going to do psychedelic music, at least take mushrooms. "I hate the kinda people who sit there and read a book on how to do psychedelic music, when you’re meant to take loads of mushrooms and start dribbling and see what happens, you know what I mean. Designer psychedelia is not what it’s about."